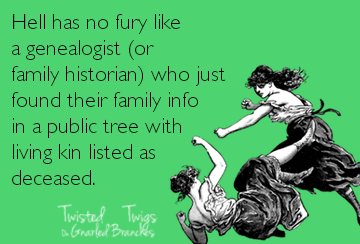 This entry was posted in Friday Funny, Research and tagged Family History, Faulty Research, Friday Funny, Genealogy by Catherine. Bookmark the permalink. HA HA HA!!! Trusting that you appreciate my rather restrained description of people like the bloke whose research is so “faulty” that he reckons my GGGrandmother’s dad was FOUR YEARS OLD when she was born. How true!! I have had an example of my great great grandfather with 8 daughters (I have his marriage certificate, two birth certificates & all baptism records of his children to prove it. ), yet someone on a well known website has him dead at the age of 22. He died at the age of 82 – I have his death entry too. It makes you want to scream! It’s also annoying when your grandfather’s d/o/b is listed on a website as being four years before his son’s, and I thought we were the ones living in an age of promiscuity ! There’s usually a way of cross checking info that looks wrong. And no, my grandma wasn’t married to her own son just because he and his father shared a name.